another apparition . . caught my eye. a strange contrast of sharp lemon yellow vs. a steely blue grey. whoosh. 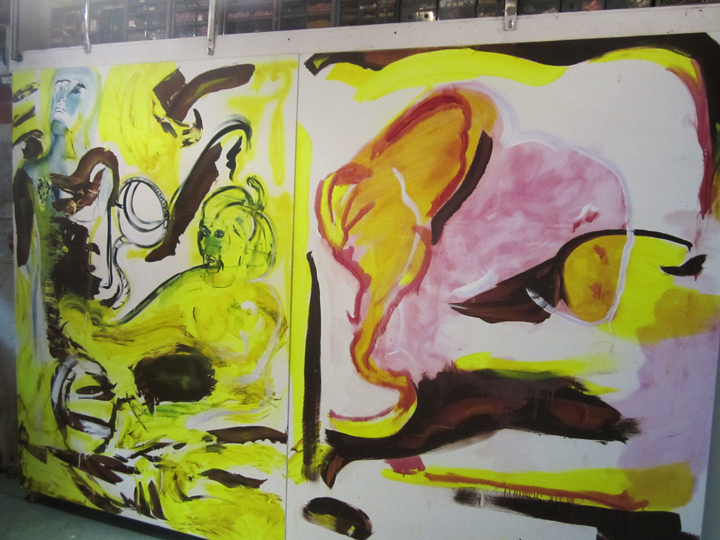 one can get, so into . . how the abstract pink ‘cloud’ on the right, morphs into the narrative world on the left. the ethereal power of a light, and light-filled .. hand. 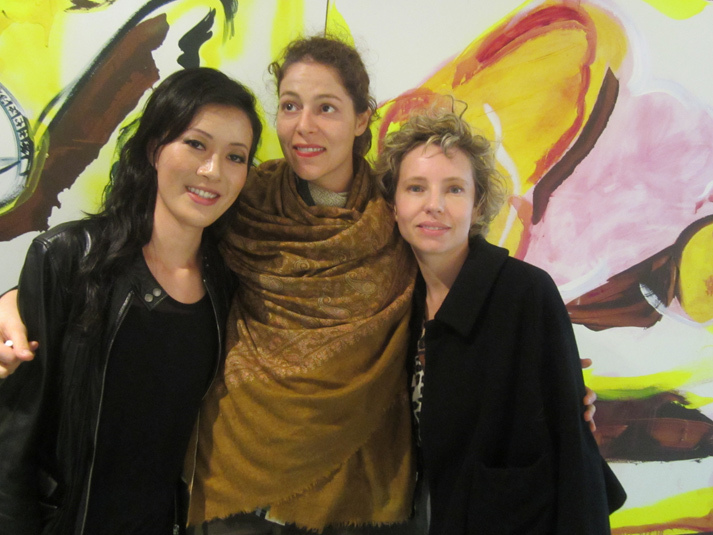 AMY LI, LOLA MONTES, and NICOLE WITTENBERG . . in front of Lola’s painting. 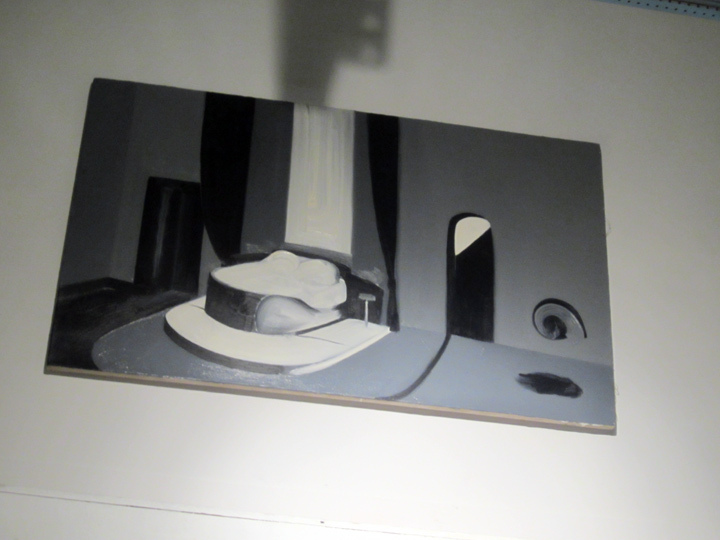 NICOLE WITTENBERG, ‘Interior 2 (Snail Song)’, oil on canvas, 25 x 42 in. really nice 2 tonal study. very cubist. should be a study in stark contrast, but is .. not !! super nice visual contrast between reality and fantasy. reality and fiction. darkness and light. the pureness of white. I guess the ‘white’ is the subject, and the narrative is that strange miniature-scaled doorway, and the squiggle lines .. to the right. 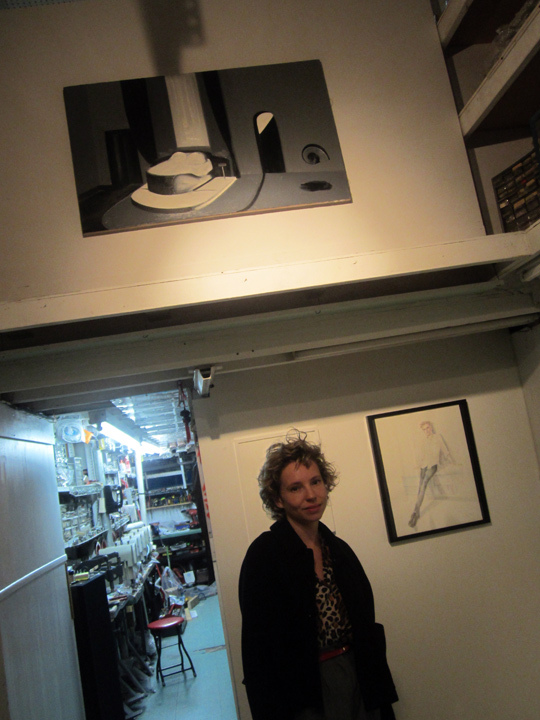 NICOLE WITTENBERG, her small minimalist composition is above her. 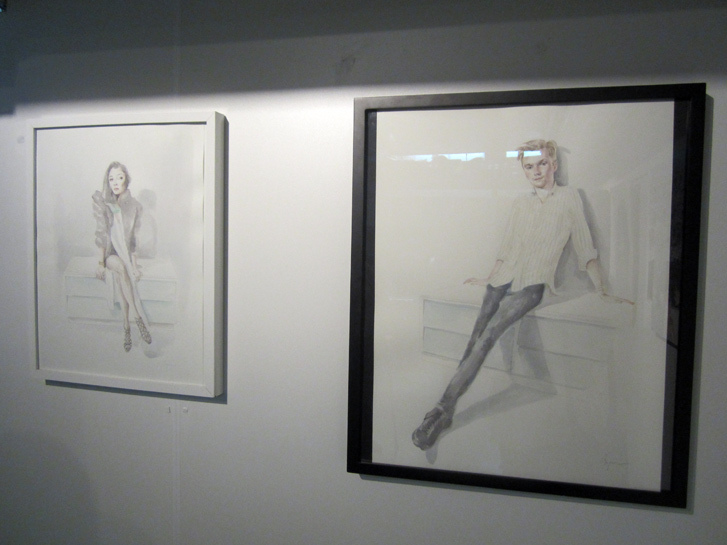 on the right is a small watercolor figure study by JESSICA BAJORES. part of the dynamic, and really .. the charm of the gallery, is catching a glimpse of the ‘life’ just beyond the gallery walls. the Chinatown storefront is home to a leather accessory finishing .. workshop. 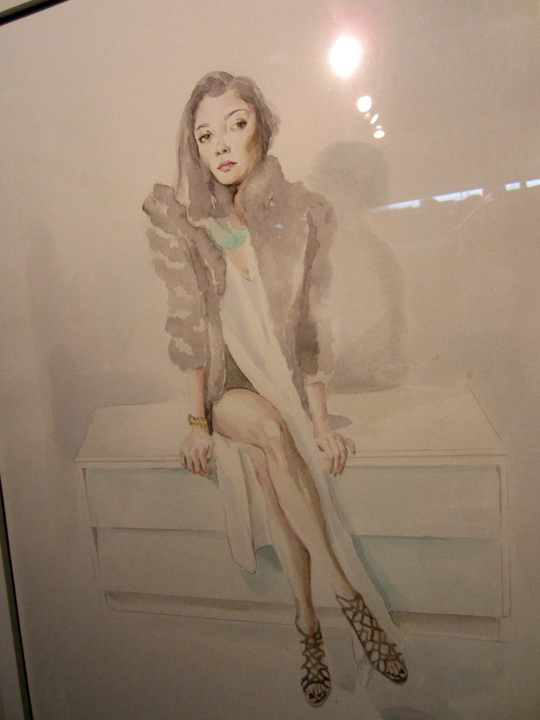 JESSICA BAJOROS had two watercolor portraits in the show. 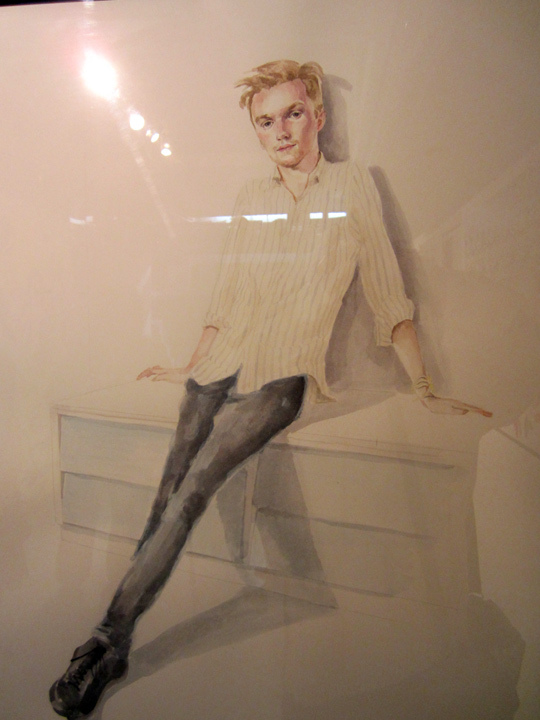 JESSICA BAJOROS, ‘Henry Hopper’, watercolor on paper, framed. 25 x 21 in. Henry Hopper is the son of Dennis Hopper. 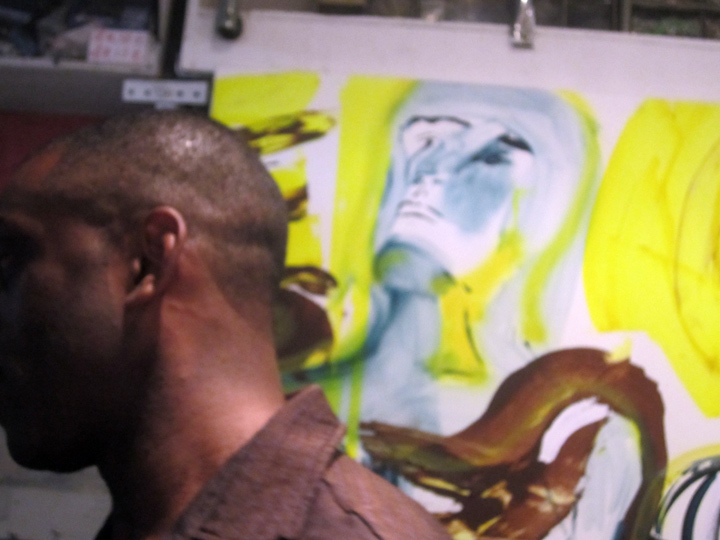 he seems to be a really nice kid, I talked to him briefly at his dad’s retrospective a few years back at Tony Shafrazi, at which time he was studying art, painting .. in California. JESSICA BAJOROS, ‘Zha Zha Vi’, watercolor on paper, framed, 20.5 x 17 in. photographer of street art, really .. ‘down-deep-in-the-subways’ street art / photographer supremo .. SEAN VEGEZZI. something about a fall off a cliff, into water .. where there was no water. 3 smart, strong chicks ..
and one totally awesome, street smart photog .. what more is there to say ? from the power of the glyphs, to the power of .. chicks. 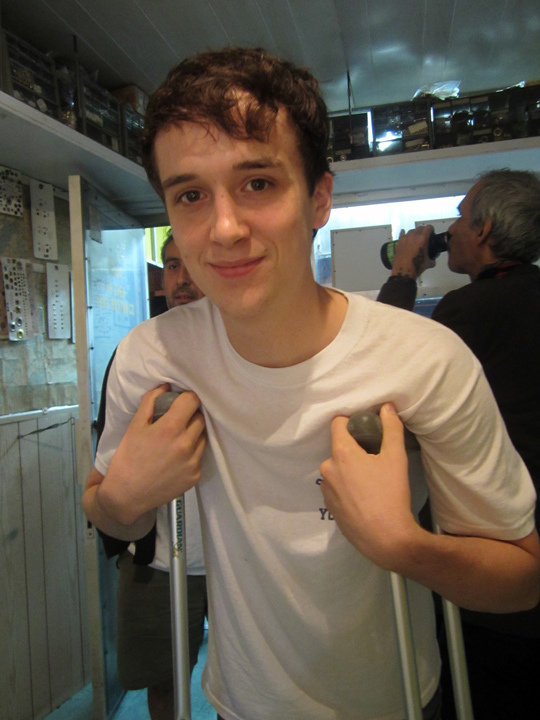 ok, how’s this . . SEAN is all of 22. I’ve been following his work – since he was 16, when I first crossed paths with him at the original CANAL CHAPTER / MINT + SERF = MIRF. SEAN VEGEZZI unravels . . reality, too.